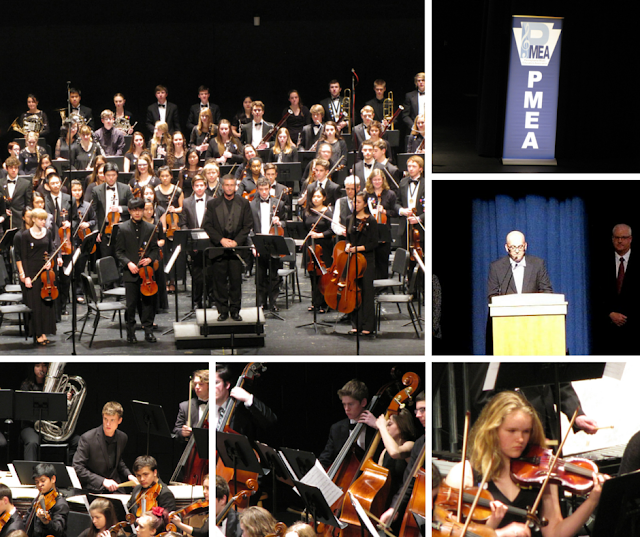 Bound only by an affinity for the universal language of music, 122 students from 47 schools across Central Pennsylvania congregated at Lampeter-Strasburg High School for the 2016 Pennsylvania Music Educators Association (PMEA) District Seven Orchestra Festival, and performed a concert Saturday evening, January 16. The concert featured four selections, including three that were written in the 21st century, a testament to Dr. Brian Norcross's commitment to playing newer music. Dr. Norcross, who teaches at Franklin & Marshall College, served as the clinician for the festival, which included three L-S students: Melissa Long (violin), Hannah Hess (string bass), and Sam Welk (percussion). Festival participants arrived at L-S early Friday morning, and entered directly into a rehearsal before re-auditioning for seating placement, as well as for Regional Orchestra, the next level in the festival progression sponsored by PMEA. Among the unique aspects of the festival was the world premiere of a piece commissioned specifically for the event, entitled "Second Sight: A Concert Fanfare", composed by Francis J. Caravella, the orchestra director at Manheim Township School District. World premiere of "Second Sight: A Symphonic Fanfare"
Other selections included "Rainbow Body", which refers to a concept in eastern religions that upon death, bodies turn into energy and light; the piece opens with a medieval chant, and depicts the transformation upon reaching paradise, Dr. Norcross told his ensemble. The orchestra also played "Ark of Noah", which Norcross commissioned at F&M several years ago, and the second symphony of Russian composer Pyotr Ilyich Tchaikovsky. The concert was a culmination of a two-day festival that included 14 hours of rehearsal time, with social activities such as a "build your own sundae" bar interspersed to help make the experience memorable for participants. "We wanted to make this festival unique," Mr. Robert Shaubach, orchestra director at L-S and festival co-host, told LSNews.org last week. Shaubach co-hosted the festival with Mr. Gary Doll of Solanco and Mrs. Sara Masten of Penn Manor. Participants who were not from L-S stayed at a hotel Friday night, something veteran festival attendee Sam Welk was not sorry to miss. "It's nice to be able to stay at home," he says. Welk will also represent L-S at the PMEA District Seven Band Festival later in January at Manheim Township along with clarinetist Justina Keller. After the concert, Hannah Hess learned that she made it to regional orchestra, an excellent feat. In his final remarks to the group before the concert, Shaubach said he was listening to the group rehearse Saturday morning, and was so impressed that he began texting several of his friends that are professional musicians, telling them they should really attend the concert, that this group was that good. "I'm always nervous for rehearsals, but by the first downbeat yesterday, I knew they were exceptionally well prepared," he says. "They're tremendous."